Ranked as sixth in the nation, 11 wins and one loss, our CSUSM women’s lacrosse club advances to the playoff rounds. Our women’s lacrosse club competes in division two and will attend the Western Women’s Lacrosse League regionals at Cal Poly, San Luis Obispo on April 13 to April 15. They have traveled across the country twice to compete in nationals in the Women’s Collegiate Lacrosse Association (WCLA) Tournament. If successful, the team will advance again this year to nationals on May 9 through May 12 in Austin, Texas. The women’s lacrosse is a student-run club initiated in 2010 by CSUSM alumni Christine Magill. The team highlights competitiveness, teamwork and community. Currently the lacrosse team holds three captains, president Emily Boles, Vice President Andrea Zepeda and Treasurer Emma Kirker. “Students should become a part of this team because we are like a second family by providing friendships and support…There is much more to this team then just playing lacrosse. We volunteer at blood drives, community events and other things throughout the San Marcos community,” said Jennifer Aguirre Vazquez, a sophomore, player from the women’s lacrosse club. Even though funding is not provided for the club, as a team, they have collectively held fundraisers by selling candles and having a car wash. The team currently has 12 players and are seeking to have 20 to 25 players. Vazquez encourages students with or without playing experience to join the women’s lacrosse club. “We have had many players who come from different backgrounds and… we are one of the most bonded group of people and team on this campus,” said Vazquez. Practices are held from Monday through Wednesday from 6 p.m. to 8 p.m., and on Thursday from 7 a.m. to 8 a.m.
Come support our women’s lacrosse club on their last home game against Northern Arizona University Lumberjacks, on March 31 at 11 a.m. Good luck to our Cougars! 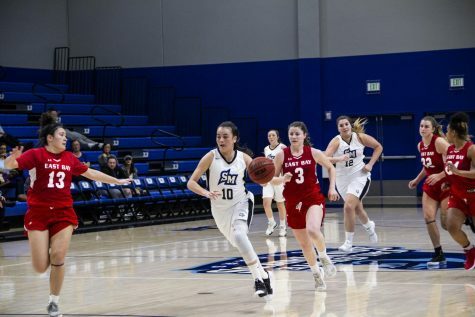 CSUSM women’s basketball advance to the CCAA semifinals. 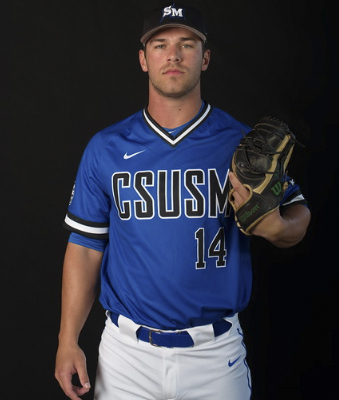 CSUSM win against CSUMB, advance to 17-9 overall.